Think Stardew Valley, but with hints of The Wicker Man. PixelCount Studios isn’t a stranger to creating beautiful fantasy worlds. Once upon a time the team helped develop the Fable series and design the mythical landscape of its home world Albion. 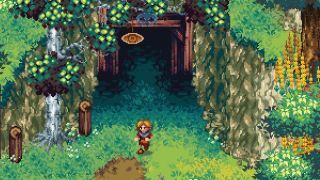 Rising from the ashes of Lionhead, PixelCount is now making its ﬁrst indie game, Kynseed, where the land murmurs with myth and fantastical beings tread. Kynseed is set in the Quill, a leafy country of villages and vales surrounded by forest. You can explore it at your leisure while farming the land and running a business, though there is more to Kynseed than living a quiet life. Monsters dwell deep within the trees, and the people of the Quill are a little strange too. Alongside eccentric locals, such as gatekeeper Herbert Lemon and cattery owner Hazel Nutt, there are four types of Fae who visit from different realms. One of these Fae is the jolly but sinister Mr Fairweather, who offers you a mysterious acorn called the Kynseed. Once planted, it grows into a family tree that feels like it’s watching over every decision you make. Inspired by tales of superstition, each village in the game has its own personality, from the grumpy Puritans of Tunt to the pie lovers of Poppyhill. The denizens of the dark forests have also been plucked from British and Irish folklore, combining recognisable creatures, such as banshees and dragons, with stranger ones that I’m forced to Google, with enticing names like the barghest, fachan and gwyllion. This love for fairytales and folklore has influenced the team from a young age, in particular Edwards who found magic in every corner of his hometown. The rural landscape of The Wicker Man has ebbed into the visual style of the game, which depicts an abundant landscape befitting a fantasy novel or nature guide to a fairy realm. And though there are thematic similarities with the Fable series, making Kynseed has enabled the team to design a game on a much more personal scale. Although you can spend your time pursuing a reputation as a monster slayer, you can also focus on more relaxing ventures, such as building a tavern, or running an apothecary. Every ingredient has certain traits, from flatulence to shrinking, curse trumpeting to courage. Discover these traits, and you can use them to cure disease, buff stats or play pranks. Whatever you do, we can’t wait to brew our own batch of PCG beer.